This is another recipe from my cooking class (with adaptations). 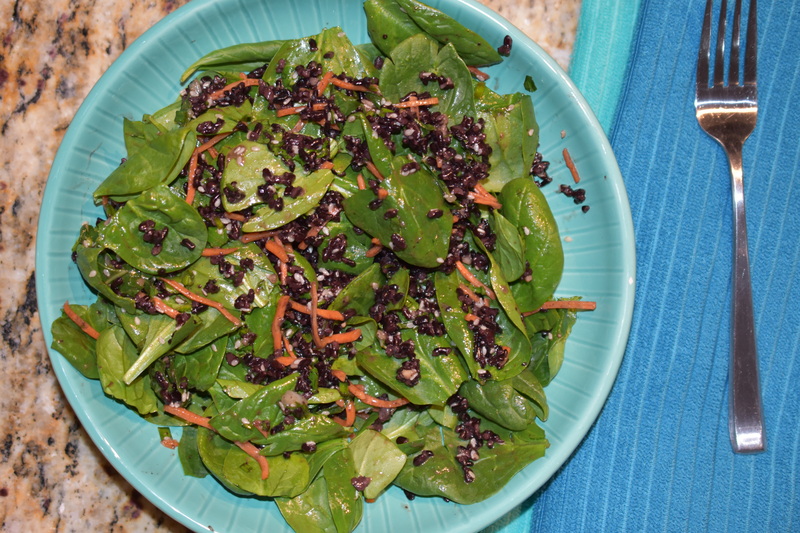 Mix the rice with some fresh spinach or kale and you have a fresh nutritious salad that your family will be wanting more. I have made Forbidden (Black) Rice before. It has such a wonderful unique flavor, compared to any other rice. Whisk together all the ingredients in a measuring cup with a pouring spout. Combine rice mixture and dressing together in a large bowl. Stir until mixture is well incorporated. Cover bowl and refrigerate for at least 30 minutes. By doing this step the rice soaks up the dressing and the flavor. Serve rice mixture over some greens. Eat. Enjoy.